Let’s now see the different functionalities of the TextBlob library. Noun phrase extraction, as the name suggests, refers to extracting phrases that contain nouns. Let’s find all the noun phrases in the first paragraph of the Wikipedia article on artificial intelligence that we used earlier. In a previous section, we used Python’s built-in len method to count the number of sentences, words and noun-phrases returned by the TextBlob object. We can use TextBlob’s built-in methods for the same purpose. In the following example, we will count the number of instances of the word “intelligence” in the first paragraph of the Wikipedia article on Artificial Intelligence. Like word counts, noun phrases can also be counted in the same way. The following example finds the phrase “artificial intelligence” in the paragraph. N-Grams refer to n combination of words in a sentence. For instance, for a sentence “I love watching football”, some 2-grams would be (I love), (love watching) and (watching football). N-Grams can play a crucial role in text classification. Let’s see how we can perform text classification with TextBlob. The first thing we need is a training dataset and test data. The classification model will be trained on the training dataset and will be evaluated on the test dataset. 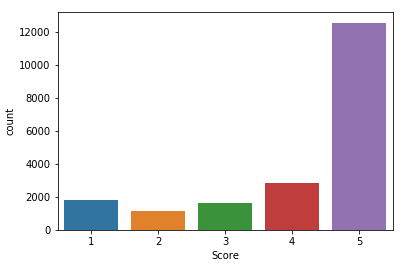 In this section, we tried to find the sentiment of the movie review using text classification. In reality, you don’t have to perform text classification to find the sentiment of a sentence in TextBlob. 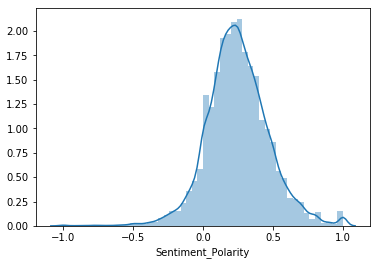 The TextBlob library comes with a built-in sentiment analyzer which we will see in the next section. You can see that most of the ratings are highly positive i.e. 5. 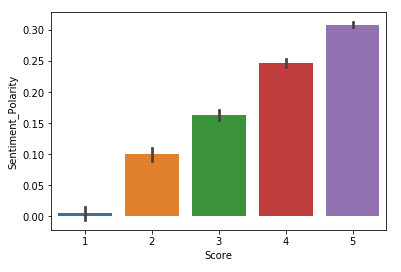 Let’s plot the bar plot for the ratings to have a better look at the number of records for each rating. Let’s randomly select a review and find its polarity using TextBlob. Let’s take a look at review number 350. It looks like the review is positive. Let’s verify this using the TextBlob library. To find the sentiment, we have to use the sentiment attribute of the TextBlog object. The sentiment object returns a tuple that contains polarity and subjectivity of the review. Let’s find the sentiment of the 350th review. 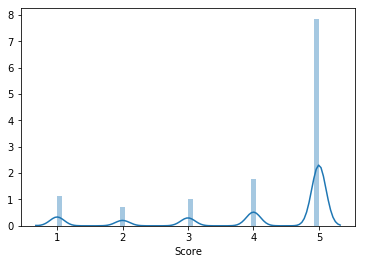 Let’s now plot the average polarity for each score rating. Let’s now see some of the most negative reviews i.e. the reviews with a polarity value of -1. Let’s print the value of review number 545. Let’s now see review number 223 which also has been marked as positive. Python’s TextBlob library is one of the most famous and widely used natural language processing libraries. This article explains several functionalities of the TextBlob library, such as tokenization, stemming, sentiment analysis, text classification and language translation in detail.